Browse Information from different Sqlite Files (.db, .db3, Sqlite, Sqlite3, .fossil). 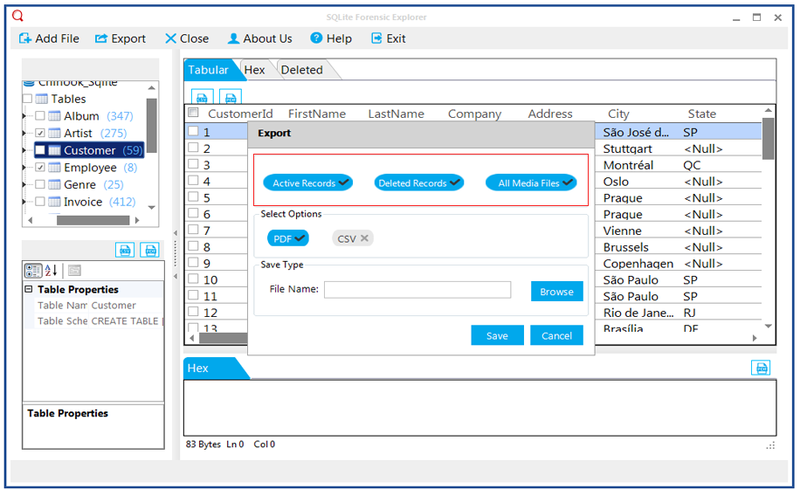 Featured option to add multiple Sqlite Databases within single case. Recover & View Deleted and Password Protected Sqlite Database. No File Size Limitation to Open Sqlite Database in Windows Operating System. Sqlite Forensics can be scanned, opened, and viewed within the software. All components of Sqlite database, i.e. tables, indexes, triggers, views, and columns can be previewed with the tool. Sqlite forensic tool allows opening corrupt Sqlite database of different variants (.db, .fossil, .Sqlite etc.) There is no need to connect with the server to open Sqlite database on Windows. 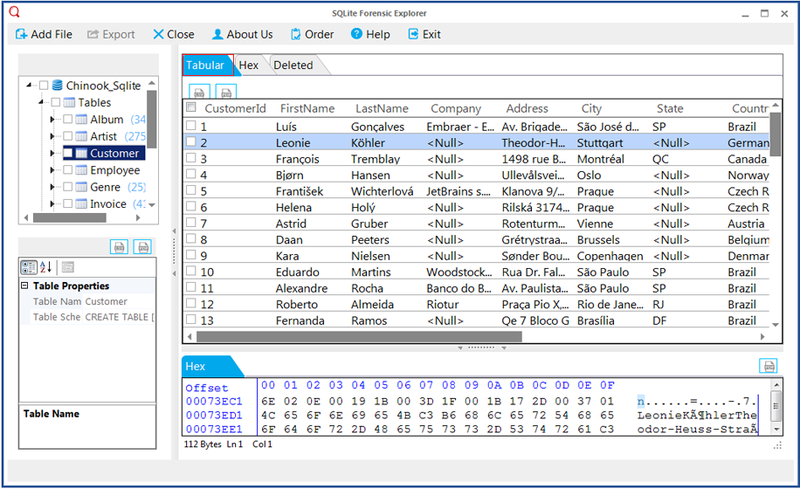 By using the Hex View option users can analyze the emails of Sqlite Database in binary file format. The software is capable enough to detect operations performed on each byte of the message. BLOB is a special data type which can store large amount of data in SQL server table along with multimedia components. 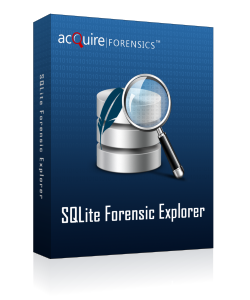 With the help of Sqlite Forensic Tool users can preview and analyze this special type of database. There is no limit for the database file size that can be viewed. Sqlite file of gigabytes and terabytes can be recovered and opened. Moreover detailed status of the file and its items can be checked. To filter out specific part of the database, Sqlite forensic analysis tool includes the Search option. A suitable phrase can be used to filter out desired table, index, view, or any other components that gives a clue to investigation. Sqlite Forensic Analysis Tool: The Advantages! 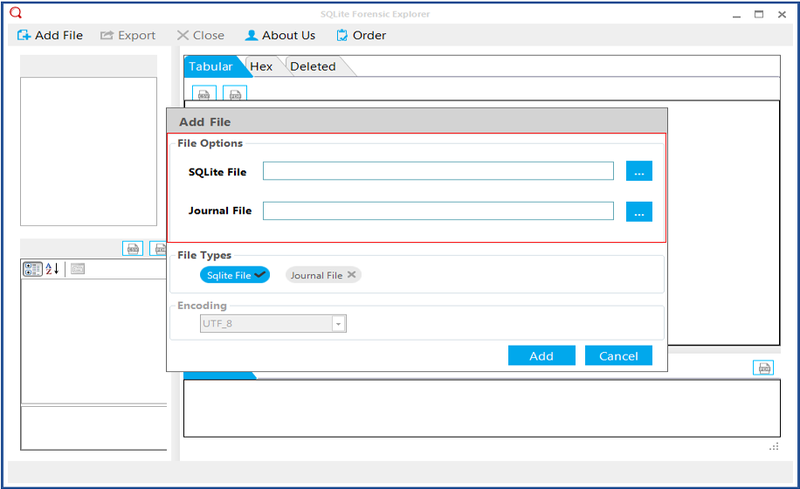 Sqlite forensic tool can help to analyze extracted data with the advantage of previewing the database in a tabular form. The DB browser consists of a number of features that helps to simplify forensics procedure by carving out and collecting artifacts that gives investigation a turn for successfully extracting evidences for litigation. Sqlite Browser Support: The Sqlite reader generates preview of varies data files that stores information about a browser. The freeware supports opening database of popular browsers including Safari, Google Chrome, Mozilla Thunderbird, Opera, and others. These web browsers uses Sqlite as the primary storage for database. Smartphone DB Scanner: The contact list, the message chat history, the social networking/IM chats, the information about apps and their related data gets saved into Sqlite. Smartphones working on technology like Android, iOS uses Sqlite to store the database. However, to view the DB in the tool, the data should be available in non-encrypted form. Email Database Reader: A list of desktop mail clients use Sqlite database to store its data and for its easy fetching. Email applications like Incredimail, Outlook 2015, Mailbird, etc. uses Sqlite for saving the mailbox information along with settings, contacts, calendars, and related data. Does the Sqlite forensics software supports viewing corrupt DB file? "My Google Chrome has some account passwords saved. Now when I open the accounts, it asks for the password to login which I don't remember. Seems that the Sqlite login.db file is having some trouble. Will the software allow me to view the contents of login.db file of Google Chrome?" A. The software scans the added DB file before preview. So, if the DB file is corrupt, the tool will first recover its contents and then allows previewing it. We want to view Whatsapp Chat details for investigation. How will the Sqlite forensic tool help? Whatsapp chat history gets saved into msgstore.db file which is located at /data/data/com.whatsapp. The tool will allow opening it with and analyze the database components to carve artifacts. What is the maximum file size that can be opened with the tool? There is no limit to the Sqlite file size. You can open file of any size in this Sqlite file reader program. At a time, how many databases can be added and opened? In a single running instance of Sqlite forensic analysis the tool, you are allowed to add only one Sqlite file into the software. More file can be added and previewed but one-by-one. Sqlite forensics is so helpful & the best part is it is absolutely FREE. A huge thanks for rendering such a wonderful service, that too with such an efficiency. 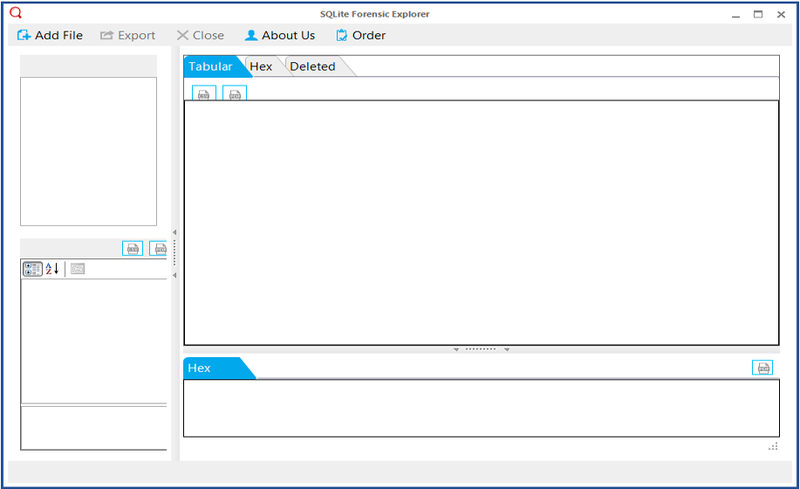 Sqlite forensic get started by analyzing the database. This tool has given a trustworthy platform to open the DB file on Windows and examine its contents. Copyright © 2007-2016 FreeViewer Software. All Rights Reserved.